Pretty much every household in New Zealand has a car — or two or three — that needs to be housed safely off the street. 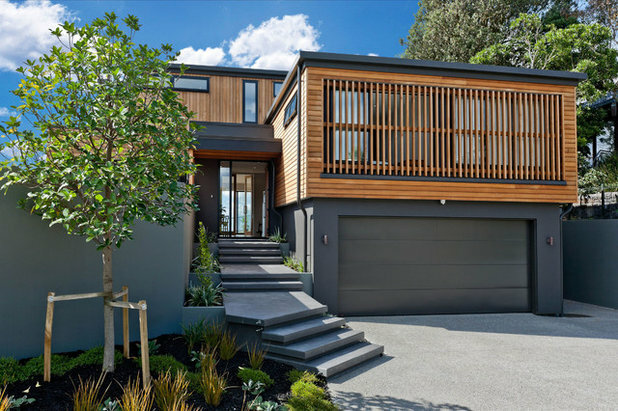 But a huge driveway, bulky garage and dull roller door can spoil the appeal of a house, dominating the facade and even obscuring the front door. Whether you’re driving into your house or creating an inviting view for people walking past, here are ways to turn a necessity into a virtue. 1. Make it vanish. Take advantage of a sloping site to tuck your garage back into the site. 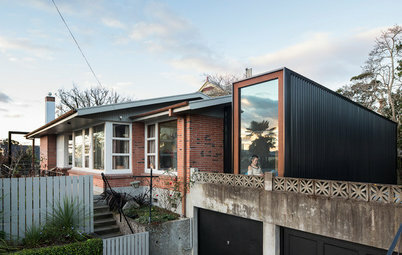 Here, Auckland’s Creative Arch architects have used a number of visual tricks to make the ground-level garage disappear into the background. Painting the ground-level walls and door a single dark color makes them recede, while cantilevering the cedar screening beyond the house draws the eye to the upper floors. By wrapping strong stairs from the street to the front door and adding a dark plastered wall around the courtyard to the left, they have balanced out the bulk of the garage. 2. Divide and conquer. 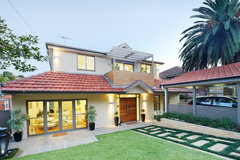 A double garage facade runs to 25 feet or more. Creating a separate building, or breaking it away from the main house with a change in wall alignment or separate roofline, reduces the visual bulk and gives you the opportunity to create more human-scaled proportions. In a modern setting, pulling the garage away from the house gives your architect the chance to play with transparency and proportions. 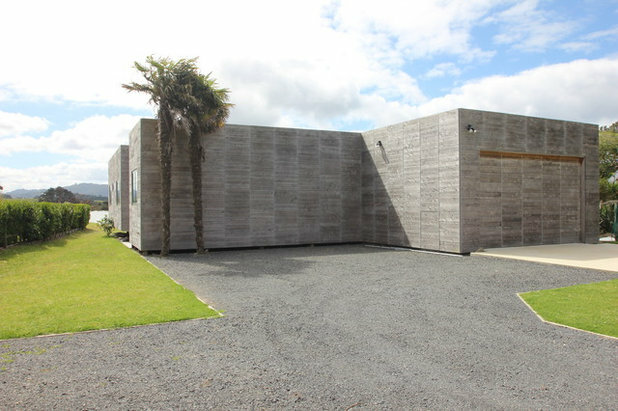 In this award-winning house at Mahia Bay, Julian Guthrie used the space between house and garage to create an internal courtyard sheltered from the winds but joined by a sturdy beam. 3. Have it stand alone. The internal-access garage has become a byword in real estate advertising. 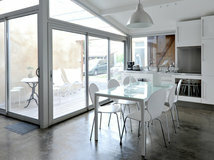 But sometimes the best solution is to go back to old-school notions and separate the garage completely from the house. You can play with fine craftsmanship, such as these floating roofs and slatted screens, to provide a light but sheltering space. 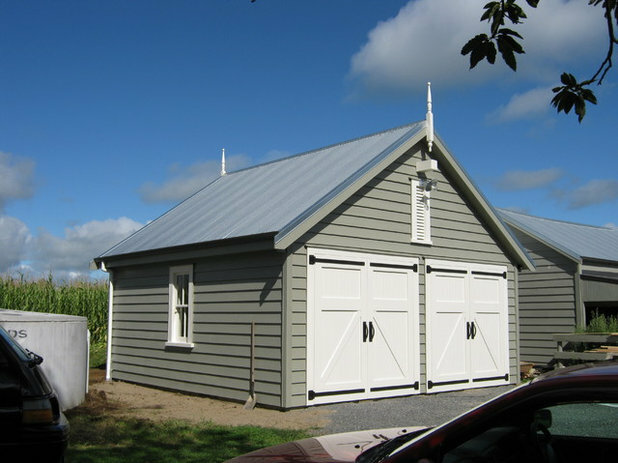 If you have a traditional house with room on your plot of land, a traditional barn-style garage recalls the stables of finer houses of last century. 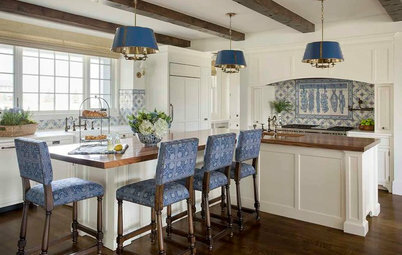 Echo the original house’s bargeboards, finials and woodwork, and install crafted doors that reflect the bygone era. Take advantage if your house is on a corner or has a separate vehicle lane by tucking a small-scaled garage around the back. 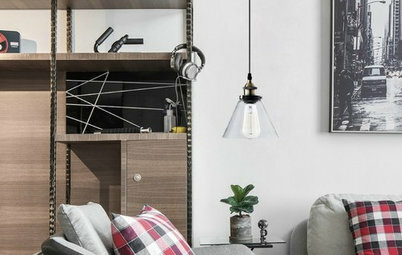 Use gable-end windows to draw in the light, slip in a studio or work shed facing the garden side and you’ve created a garage that does double duty. 4. Take sides. Think of this as the garage equivalent of turning sideways to the mirror while sucking in your tummy: Suddenly that big, bulky, front-on slab of door looks so much slimmer and more elegant. 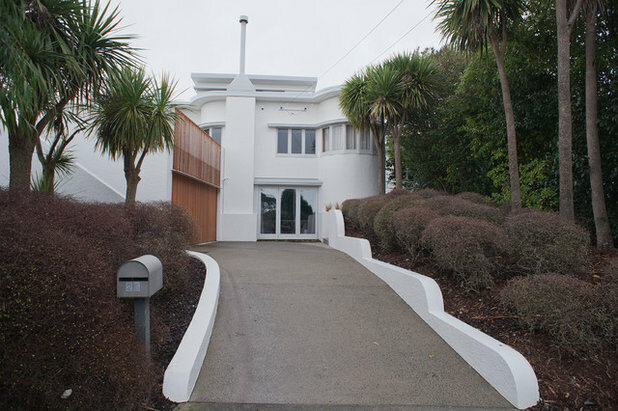 Here, a single-level Art Deco house had a full basement rumpus room and garage added without destroying the graceful lines of the original house. 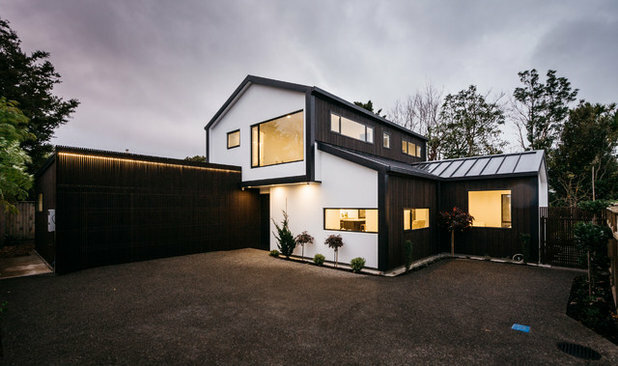 Architect Monika Puri of 242am made the garage on this Christchurch home appear to disappear by using dark-stained wood and tucking it to the side of the main house. 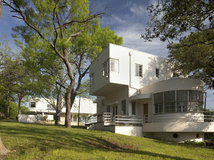 Again, she brought the upper floor forward to make it — not the garage — the focal point of the facade. 5. Light it up. 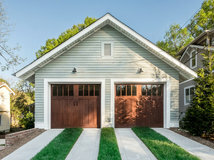 When there is nowhere else to hide, make a virtue of the garage with expressive doors that mimic the rest of the house. 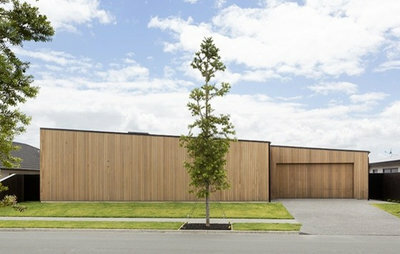 Here, architect John Mills used semitransparent materials and batten to break up the mass of the below-the-street garage in a tight Wellington site. 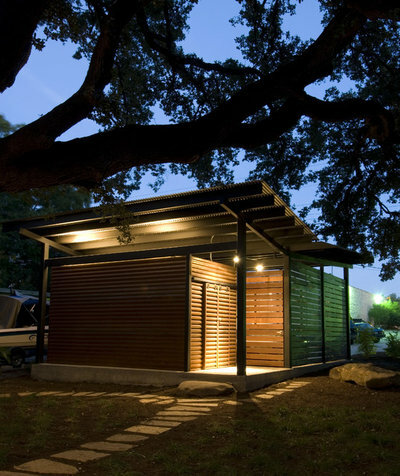 Lighting the lantern-like box after dark creates a welcoming street facade — easy for visitors to find too. 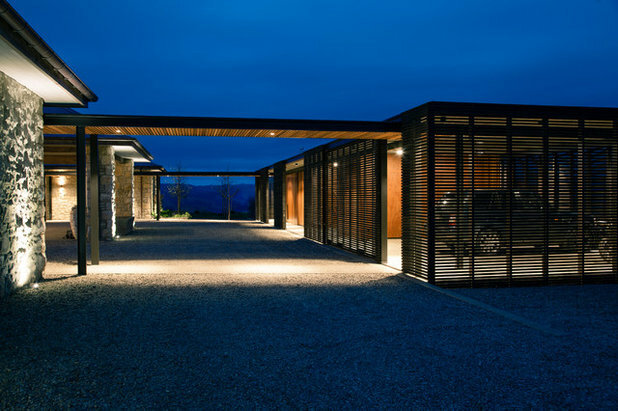 Here, Herbst Architects create a similar lantern effect on a large country estate: Wood screens lighted from behind create a showroom effect for the cars; wood-lined walkways create inviting slim “threads” leading to the bulk of the stone-pillared entrance way. 6. Block it out. 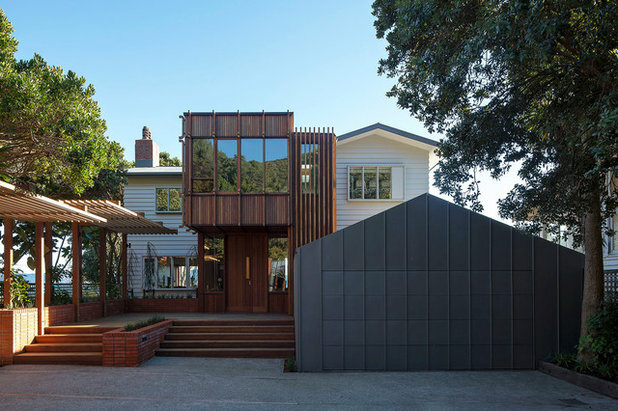 This house in a beach community north of Auckland by architectural designers Furze Design takes the opposite approach: Blend the bulk of the garage into the block of the house to create a series of boxy sculptures. 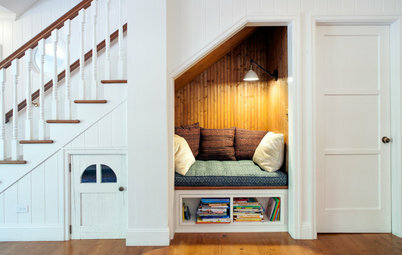 It works because of the material — bleached and weathered wood — and the just-so massing of the proportions. 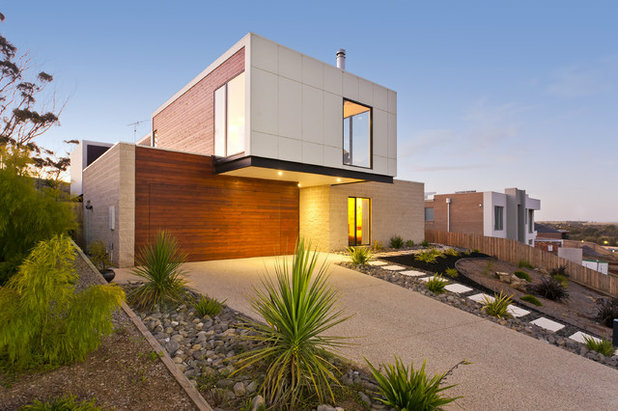 A lighter version by Hamilton architectural designer Noel Jessop uses slim vertical timber and a raked roof to make the same statement. The intrigue of a house with no windows to the street just works. 7. Compare and contrast. 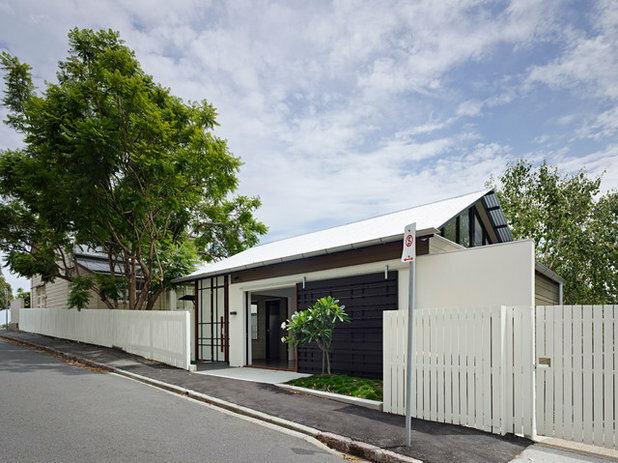 A statement garage in a completely different style and materials to the original house needs a brave hand to make sense of the lines. 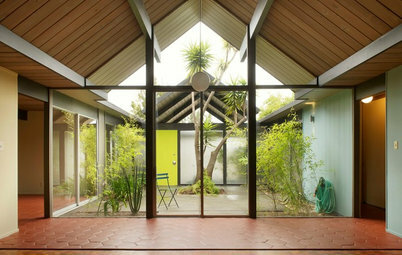 Here, Studio Pacific Architecture has slid a toy-box-simple solid gabled box in front of a gabled house. 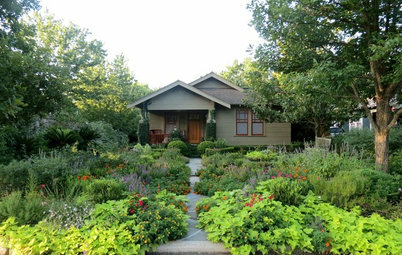 It repeats the angles of the house roof, but recedes against the assertive cedar sunroom above the entrance. Welcoming stairs and pergolas help to minimize the impact too. Again, by framing the cedar box of the garage against the creamy modernist stone of the rest of the house, the garage has become a sculpture, not an eyesore. 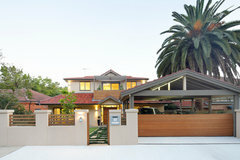 Landscaping directs pedestrians to their part of the house. 8. Respect the house. 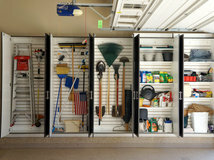 If you can’t make the entire garage disappear, at least slim it down by removing walls. In historic neighborhoods where space — and rules — are tight, a sliver of carport creates the desirable off-street parking without hiding the original house. Careful attention to details of rooflines, rafters and corbels at the top of the posts respect the house and streetscape. 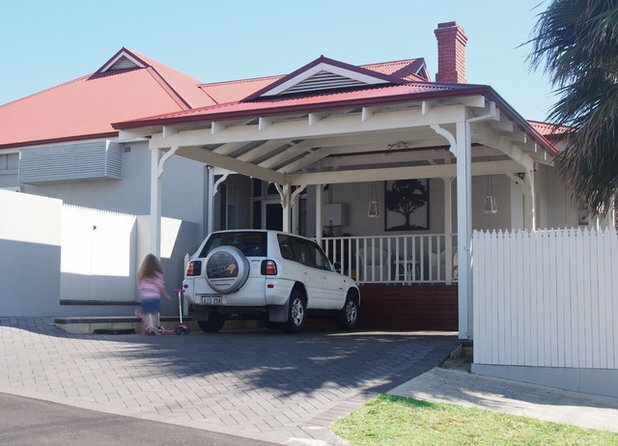 Even more clever is to tuck the carport into the fence line for a now-you-see-it-now-you-don’t solution. 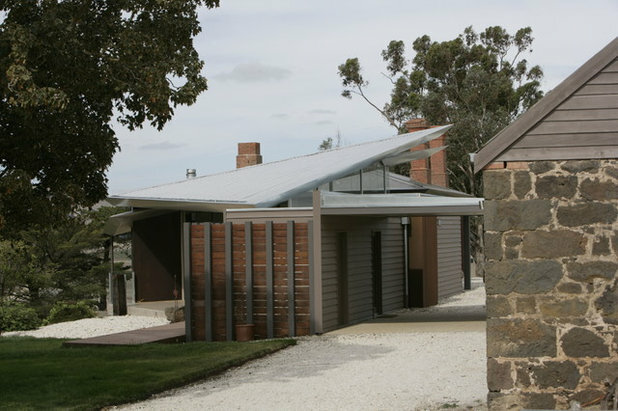 Here Centrum Architects floated a new roof above the ruins of an old Victorian, so that the glass planes hover over the old stone walls.The barely-there carport is an extension of the floating planes where old meets new. 9. Dig deep. On a sloping section, digging the garage into the hill and then cantilevering the house out over it makes it virtually disappear. 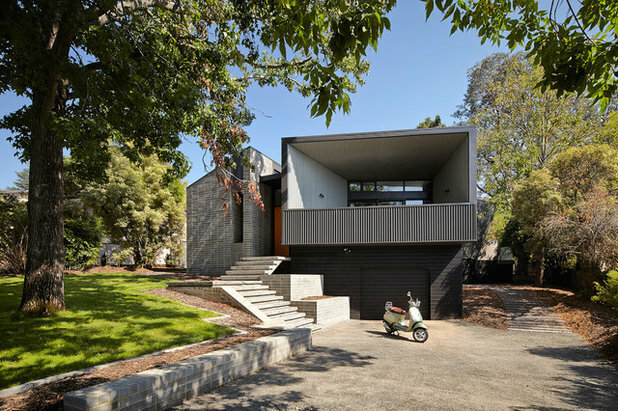 The same clever tricks we’ve seen before — a dark, receding color, emphasizing steps and pedestrian entrance by scaling them up, and using changes of levels — all help to de-emphasize the garage. 10. Turn it into a feature. 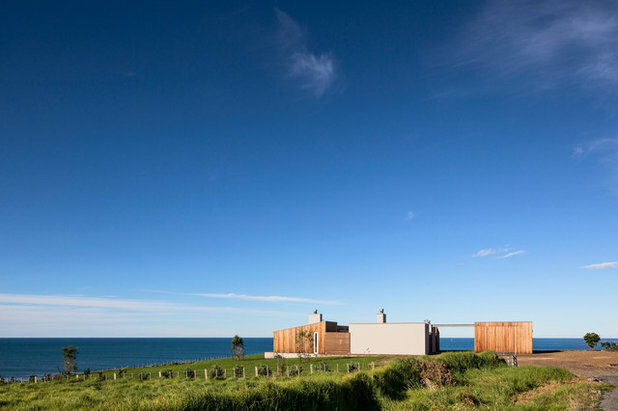 In this breezy beach pavilion in coastal New South Wales, Australia, by Mackenzie Pronk Architects, the shutters and panels of the house are writ on a larger scale for the garage, admitting breezes and creating a striking focal point. 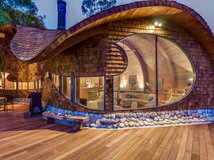 Landscaping with pebbles and just enough pavers for car tires has further blended the garage into the house and site. 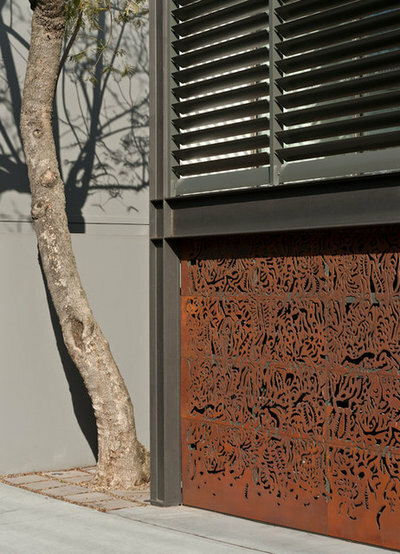 A pierced steel screen by Sydney metal artisans Axolotl has made an unforgettable feature of a garage door. The piercings have the added safety benefit of allowing drivers to spot pedestrians before they open the doors. When lighted, the garage is a work of art. Excellent article! 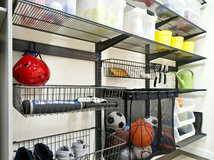 I spent several years installing garage doors early in my career. 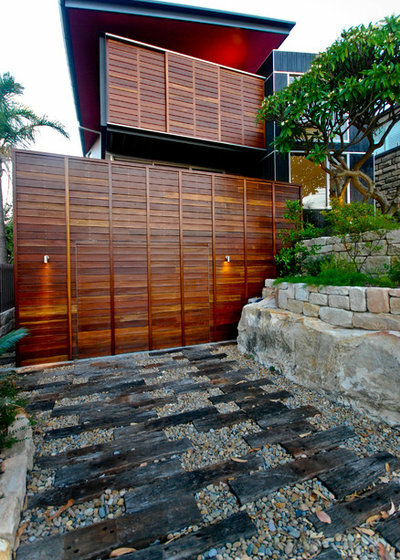 Garage doors have come a long way in the last twenty years. There are so many more options for our clients to choose from. 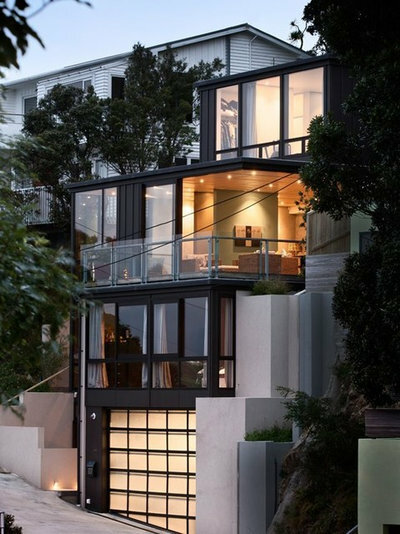 The garage doors sometimes takes up fifty percent of the exterior facade. Replacing the doors is an easy and cost effective way to add curb appeal, but choose carefully. 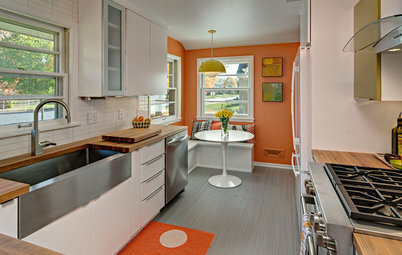 The wrong door style could clash with the original architectural design of your home. My garage totally disappears from the front of my 1850s brick rowhouse - I don't have one. We park on the street in the neighborhood and I have no regrets. Plus, there is no parking on my side of the street so it is nice to talk home and see no cars in front of the house. Having undercover off street parking was a pre-requistite for my car loving husband. The advice in the article was spot on......as our garage/carport was separated from the house with its own roof......and it still looks amazing. 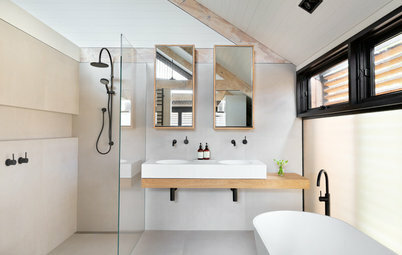 Contemporary in design, space enhancing and easy to maintain — what’s not to like about a walk-in shower?